A pleasant morning on patch kicking around for migs. Although the forecasted north-westerlies were never going to drop much in, it was nice & calm first thing and the prospect of something out of the ordinary knocking about dragged me out at 7.30, despite only 5 hours kip. An acro at Shite Lane kept me occupied for a bit, until it revealed itself as a sedge warbler, and there were a few willows and chiffs around too. 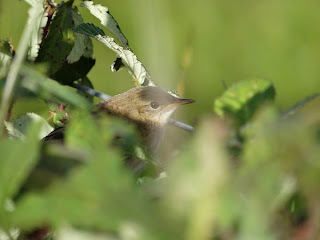 Further on round, a warbler jumped out of some brambles and sat on the fence really close for what seemed like ages - grasshopper warbler - always great (and hard) to see one well. Eventually I managed to wrestle the new cam out of its case by which time only the birds head was visible - still, quite pleased with the one shot I managed. A few waders were on the move with dunlin and ringed plovers going over but couldn't manage a year tick today. Maybe tomorrow?